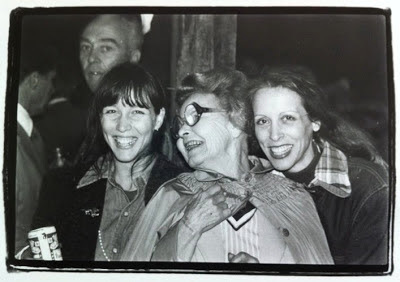 (l to r) Elizabeth P. Avedon, neighbor Texas Wagstaff and Pat P. Perini. Bar-B-Q celebrating Richard Avedon's exhibition "In The American West" at the Amon Carter Museum. Perini Ranch, Buffalo Gap, Texas, 1985. Unfortunately my sister, Pat, an extremely accomplished person, passed on to broader skies this month. In her 30 year career as a production executive, producer, director and writer, she created many award-winning PBS programs. These include: the four hour film documentary LBJ, which she developed and executive produced for PBS' The American Experience (two Emmy nominations, duPont-Columbia Broadcast Journalism Award, Ohio State Award); The West of the Imagination, six hour documentary series on the American West as told through the eyes of its artists, which she developed based on the work of Pulitzer Prize winning historian William H. Goetzmann (Best History Program, American Film and Video Festival); Katherine Anne Porter: The Eye of Memory, a 90-minute special for the PBS series American Masters; The Fig Tree, a dramatization of Ms. Porter's short story for the WonderWorks series; Facing Evil with Bill Moyers, a 90-minute documentary; The Aspern Papers, a new American opera, based on Henry James' story, for the Great Performances series; and three specials on the quadrennial Van Cliburn International Piano Competition (Emmy Award). She was production executive of the feature film The Killing Floor and Mark Twain's 'The Diaries of Adam and Eve' for American Playhouse; Strokes of Genius, a series profiling five American Abstract Expressionist artists; and the original 26-part series With Ossie and Ruby, a showcase for multicultural performances, starring Ossie Davis and Ruby Dee. Pat also produced self-help, medical and health programming. Her credits include: the acclaimed two-hour special Straight Talk on Menopause; its two-part sequel, More Straight Talk on Menopause and Women’s Health; the 90 minute special, Straight Talk on Prostate Health; the one-hour special, A Conversation with Thomas Moore, best-selling author of Care of the Soul and Soul Mates; Parenting for Today - Who's in Charge? ; the 26-part medical series Life Matters, the 10-part Good Health from Jane Brody's Kitchen, and the one hour special The National Nutrition Quiz. She brought to PBS two programs on personal security with Chicago Detective J.J. Bittenbinder: Street Smarts: How to be a Tough Target and Street Smarts: Straight Talk for Kids, Teens and Parents. In the area of public affairs programming, Pat negotiated and executive produced The Texas Debates, two of the first nationally-televised Presidential debates (Republican and Democrat) for the 1988 Presidential primaries; The Making of a Speaker, a documentary on former Speaker of the U.S. House of Representatives and former Texas Congressman Jim Wright; Locked Out of the American Dream, a documentary on America's affordable housing crisis; and The Other Side of the Border, a documentary on immigration from Mexico. Pat served on all major PBS advisory committees on programming, marketing and promotion and was a founding member of the Great Performances Alliance, which managed the selection of programs for PBS' acclaimed performing arts showcase series, and Public Television's Latino Consortium Board. She served on advisory committees and review panels of the Corporation for Public Broadcasting, the National Endowment for the Humanities and the Prime Time Emmys, and chaired the Media Panel of The Texas Commission for the Arts. As producer, she spearheaded many media projects which were awarded funding from the National Endowment for the Humanities, National Endowment for the Arts, and the Corporation for Public Broadcasting. Pat joined Dallas PBS station KERA-TV in 1969 as promotion director to launch Newsroom, an alternative news program created by Jim Lehrer, who was then beginning his television career. Ms. Perini rose within KERA to senior vice president of programming and executive producer of national programming, and led KERA to recognition as an award-winning national producer for PBS. As of 1992, she worked as an independent video producer. In 1985, she met her second husband, Robert Long, owner of Long Vineyards Winery, while producing a program on wine for PBS. She moved to the beautiful Long estate overlooking Lake Hennessey in 1987 and balanced her time as a devoted partner in the business of Long Vineyards, a video producer-director-writer and an active participant in local community service. She chaired the Editorial Committee of the Napa Valley Vintners Wine Auction, served on the board of the Napa Valley Opera House Theatre, and as vice president of the boards of Napa Valley Community Health Clinic Olé, which provides health care to Napa’s wine workers, and Music In The Vineyards, a summer chamber music festival held every August. Her video, ‘Coming of Age: Napa Valley,’ commissioned by COPIA-The American Center for Wine, Food and the Arts, documents the cultural and historic contexts of Napa Valley wines. Born in New York City, raised in the Memorial area of Houston, Texas, Pat out shined us all with a Master of Arts from Johns Hopkins University and a Bachelor of Arts Degree (History and Literature major, Phi Alpha Theta Honorary History Fraternity) from the University of Texas. She is survived by her husband, Napa Valley vintner Robert Long, and her daughter, Dallas Gourmet Chef Elizabeth Perini; and across continents and coast to coast, cousins, nieces, nephews, women's groups, close friends and colleagues. Her daughter Elizabeth said it best, "She was amazing!" In lieu of flowers, a donation can be made to Clinic Ole, which provides health care to Napa’s wine workers. I knew her for 30 plus years and didn't know about all these accomplishments. Thank you, Elizabeth, for cataloging the many and varied contributions Pat made. "She was a true intellectual" is how her husband describe her and this listing of the topics that engaged her interest and the quality with which she informed people is the strongest evidence of that. Yes, we will all miss her. I remember almost all of these accomplishments but Pat wasn't emotionally attached to any of them. Her sense of self was deep and wise and true. was a sister. I will miss her forever more. Yes, she was amazing. The world here has given up a good one. I know you and many others will miss her dearly. I did not know her personally but I do know I appreciated a lot of what she accomplished. What a lovely tribute for an amazing woman. I'm sending this to all my younger women-friends as inspiration. Sorry for your loss, what a lovely tribute. 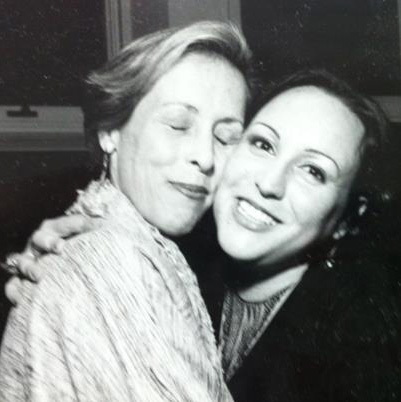 Here in the Napa Valley we are all so deeply saddened to have lost our beautiful charming, brilliant, bright, tall, red lipsticked, knitter extrordinaire, champion of all important community causes, hostess, wife, dearest friend to many, writer,and intellect. Your sister was incredible. You cannot imagine how much we all loved her. Pat was one of the great women in this valley. Our hearts go out to you and all her family, far and near. Thank you Nora, Barbara, Sue, Mercedes and all for filling in Pat's many other sides which also included creating incredible gardens to rival any in Tuscany. She really lived so many lives simultaneously and was such an extraordinary person. I had no idea your sister was responsible for so much extraordinary work. I know you two must have been so proud of one another. Thoughts and prayers to you and your family for this great loss.